Click here to purchase. Available in ebook, paperback, or audiobook format. Have you wanted to try a cycle class but feel intimidated? Or are you a seasoned rider, ready to take it to the next level? 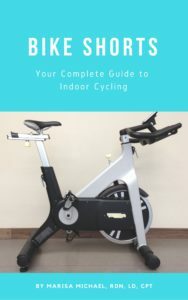 This book has all the information you need to meet your fitness goals through indoor cycling! This book is perfect for any cyclist from novice to expert, including cycle instructors. This book covers nutrition, hydration, bike fit, form, gear, etiquette, stretches, and more. It even has sample drills, sample class formats, and guides for heart rate training and calculating sweat rate. A perfect guide for you, and a perfect gift for the active person, cyclist, or athlete in your life.